When you bring home a new horse, you can’t just expect them to trust you and do as you say. Instead, you must form a bond with them that will foster that trust as well as loyalty. If you are unsure how to do this with your horse, here are a few tips. Before doing anything with your horse, sit back and observe them. Doing things like going into where they are and watching their motions and emotions can allow you to get a sense of the horse’s personality. You should also let them make the first move – allow them to come up to you and greet you on their own terms and not vice versa. It goes without saying, but you definitely shouldn’t walk right up to the horse, slap a holster on them and try to start riding. This will not help form any sort of bond between the two of you. Instead, invite the horse to meet you. Feel out the horse and their reactions and allow them to get comfortable not only with you, but their new surroundings. When are feeling welcoming, the horse will extend their nose out to explore you and get to know you. You wouldn’t let another person just come up and touch you, so don’t do that with your horse. Ask for their approval before exploring defenseless areas on them. From there the horse will get no longer look at you as a potential predator, but rather grow to respect you and build a greater degree of comfort with you. This will also allow you to find the horse’s itchy areas, which can also be used to comfort your horse. 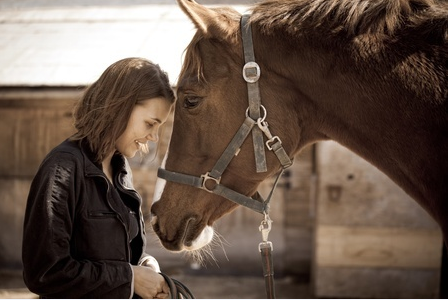 Many horses enjoy human contact around their face. Whether it’s massaging their ears, rubbing under their eyes, or gently cradling their muzzle with your palm, this kind of interaction can really help you both gain comfort with one another. Of course, keeping your horse in a comfortable stable is important, too. At Deer Creek Structures in Texas, we specialize in building quality horse barns and sheds. If you would like more information on our available products, feel free to call us today at 254-546-2276.